This entree is perfect to surprise that special someone. Serve with rice or pasta and your favorite vegetable for a delicious meal. Preheat oven to 350 degrees F. Lightly grease an 8x8 inch baking dish. Combine crushed crackers, Old Bay seasoning, black pepper and garlic powder in a small bowl. Press scallops into mixture so that they are evenly coated; place them in the greased baking dish. 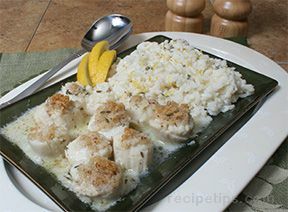 In a small bowl, mix together melted butter, wine and lemon juice; drizzle mixture over scallops. Bake in preheated oven until scallops are lightly browned, about 12 minutes. Sprinkle with parmesan cheese and cook 3 minutes more.